Continuing my policy of acquiring plots that offer maximum challenge to the gardener, I have most recently adopted a swath along the alley that runs down the middle of my block. Alleys, by the way, are one of the things that I believe make for civilized life: they get cars off the street, encourage garages to stop dominating house fronts and take up a discreet position in back yards, and provide much-needed privacy between those yards. However, they are not especially garden-friendly. The strip I’ve tackled, like most along alleys, is heavily compacted, stony, and weed-infested. Maybe eight feet wide and twelve long, it flanks an outbuilding on the west side of the alley, and is overgrown with grass and creeping bellflower (my nemesis, though not my arch-nemesis). It caught my eye because it gets full morning sun and plenty of reflected warmth from the wall behind it, and I don’t have to walk through anyone’s yard to get through it. Early last fall, when I first got the owners’ permission to plant there, I planned to avoid the whole awful business of digging out weeds by establishing my first lasagna garden. This would have meant putting down a thick layer of newspaper, and then layers of compost, earth, and compostable material. These layers would percolate over the winter and be ready to plant come spring, in the meantime smothering the weeds. I’ve found that three years under newspaper and weed cloth will kill even large bellflower taproots. Good plan, but, well, shoulder injury. On to plan B, which was possible only through the help of my estimable brother-in-law Jeff, hero of the post on plot #1 as well. When he was visiting in April, he helped me cover the alley plot with several inches of compost and a sheet of black plastic to start taming the weeds. The plastic is meant to “cook” the weeds underneath it, while depriving them of water. Given how wet and cool our spring was, I didn’t dare hope for much. But periodic checks under the plastic revealed fewer and fewer growing things, and those that did dare show their leafy faces looked a sickly yellow. After a couple of months, it was relatively easy to drive a shovel into the earth there. The black plastic effectively killed the turf, even during a largely cool and sunless spring. Of course, the bell-flowers’ huge carrot-like tubers remain, but that’s no surprise. Those have to be dug out, or smothered. So in early June I moved on to the next phase, replacing the plastic with weed cloth and starting the process of digging out the bell flower roots. I needed to let water into the compacted earth, or there’d have been no way to dig into the soil without a backhoe. This is as tough a job as I’ve ever taken on. Not only is the dirt itself rock-hard and full of stones, but there’s a layer of broken cement and stones maybe eight inches down. Then there are the tree roots—big, horizontal things that I suspect emanate from a spruce tree ten yards away down the alley. The northern edge of this plot, being relatively free of bellflower, came in for the full treatment. I dug it out to a depth of eight or ten inches, screened the dirt for rocks and weeds, then added pine duff, coconut coir, and fertilizer. This got a late planting of beans and one squash. The southern two-thirds are a different story. Here, the carrot-shaped bellflower roots, which often start two to four inches down and descend another six to ten inches, have inserted themselves between stones and snugged themselves into the minimal spaces between inch-thick tree roots. There simply isn’t time, much less energy, to dig out all of the bellflower. So I excavated isolated holes, in which I planted large, spreading plants, so the weed cloth could stay in place. I’ve done this in the past, pretty successfully, with plots which I don’t have time to prep properly: I’ll choose planting sites, weed, amend, and fertilize those, then plant into them through the weed cloth. 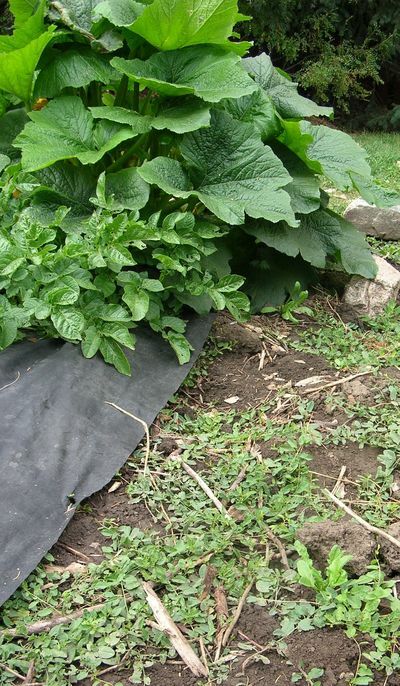 (The photo at the top shows a bed next door, several years back, with a zucchini and a potato planted through weed-cloth.) Peas, beans, lettuce, carrots are all non-starters for such a plot, as they require open ground. Instead, I go for potatoes, squash, or even tomatoes. Sounds like a brilliant idea even though there’s so much work involved, it’s worth every bit of time. Wish there was more space in my area, where I can encourage your great efforts! Hope your shoulder is getting better. I visited your site as part of a homework assignment on researching blogs. I found you via Technorati.com. While I am not really into gardening, I did grow up in the country and can relate to what you have written here. What will bring me back is your outrageous sense of humor. Thanks for the giggles! I am prepping now for my next grow season. I am going to attempt to grow some very tricky plants using some seed pods. Wish me luck! That is a great point. I am always trying to pry back good gardening land from the weeds. I understand how challenging it can be. But I did try this process myself and it does work. In my opinion, it is worth a try. Hi, Esther! Long time, no see. What an awful choice for your relative! (As is too often the case.) Here’s hoping she’s happy with the one she made. I believe in social areas at the end of every hall: no dead ends. Even a couple of chairs by a window can make a difference—though there isn’t always room. Glad you like it, Karina. Buildings and walls—most of us see too many of those already. We don’t need more, when we’re ill. Where are you? VP! How lovely! Sorry it’s taken me so long to respond. I’ll definitely look up Biophilic Cities. Thanks for the tip! They do, Ashley, they do indeed. If greenery helps people heal, I bet it lowers stress, reducing anxiety and irritation, and helps prevent violence. Parks for Peace!